"Le Pays de Domfront dans l'Orne en Normandie"
"Agenda 2019 du Pays de Domfront dans l'Orne en Normandie"
All the main events for 2019 are in this booklet. 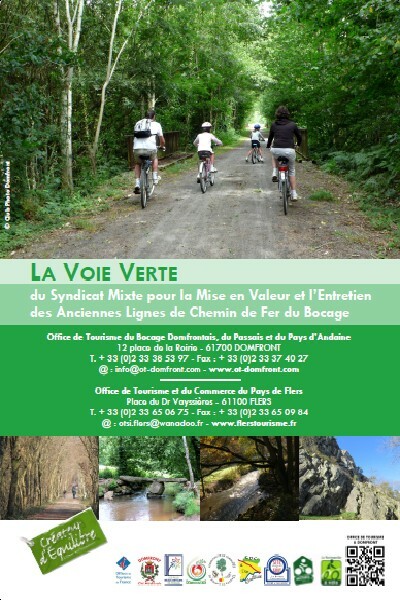 "La Voie Verte du Syndicat Mixte pour la Mise en Valeur et l'Entretien des Anciennes Lignes de Chemin de Fer du Bocage"
It has never been easier to cycle round Domfront to Flers or to le Mont St Michel, with that leaflet presenting the map of Voie Verte or "green track", the old rail-way track which has been resurfaced to enjoy activities such as walking, cycling and horse riding. Get to know all the secrets of Domfront castle thanks to that leaflet! The history, the keep, the aula, the chapel and the remparts are detailed in it. Wander round the city thanks to a map, numbered points and the correspondant commentaries. It is the best way not to miss the towers, the walls, the inner courtyards or the beautiful timber-framed houses of the medieval city. A jem of Norman and Romanesque art awaits you. The leaflet will help you point out the architectural elements of the first church listed Historical Monument in the Orne Département! St Julien church is now reopened to the public. Get to know why Domfront had a reinforced concrete built chuch in 1924 in the leaflet! "L'Abbaye Notre-Dame de Lonlay l'Abbaye"
Around 1010, William of Bellême fonded an abbey. The leaflet is a visit to the abbey church still standing, from the XIth to the XVIth century. "Les Chapelles de l'Oratoire de Passais la Conception"
Visit the Oratoire Chapels in Passais la Conception, built after miraculous healings and payers to the Virgin Mary. General information and a map to situate our megaliths which access is allowed. Standing stones, dolmens, long barrows, they all are here. "L'Escalade en Pays de Domfront"
3 sites in the area to practice your rock-climbing : La Cluse in the Domfront gap (70 routes), La Fosse Arthour in St Georges de Rouelley (170 routes) and La Roche aux Dames and La Roche aux Loups (45 routes and a block) in the Andaine Forest. The leaflets gives the level of the routes and the equipment needed. A list per département and per day for weekly markets in Lower Normandie and top Mayenne.